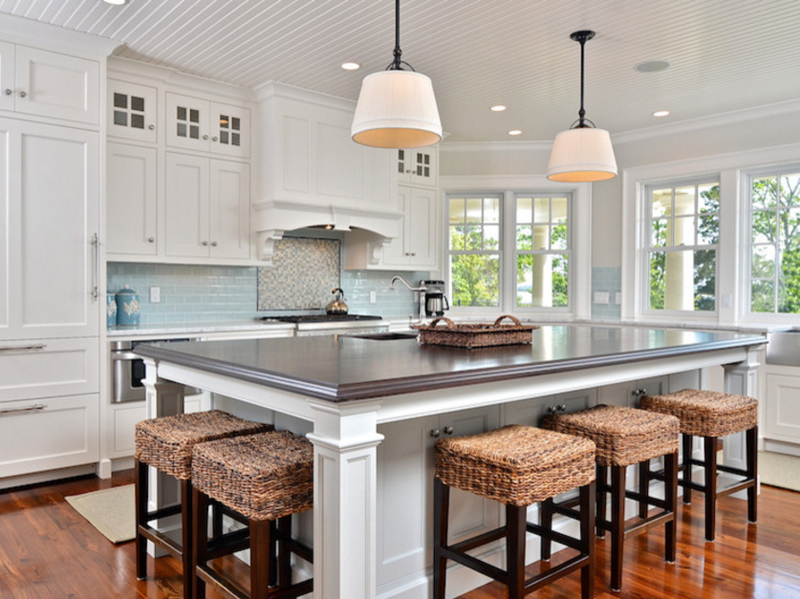 If you think rattan chairs in the kitchen doesn't look good. Think again! Rattan belongs to the palm tree family that is native to Asian countries, Africa and some other tropical country. For people living in tropical countries, trees like this one, like bamboo is a staple building material that we use both in house construction and definitely furniture! If you try to type the word rattan in a search engine in the internet you will be able to find a few of the furniture designs made from this beautiful, flexible material. 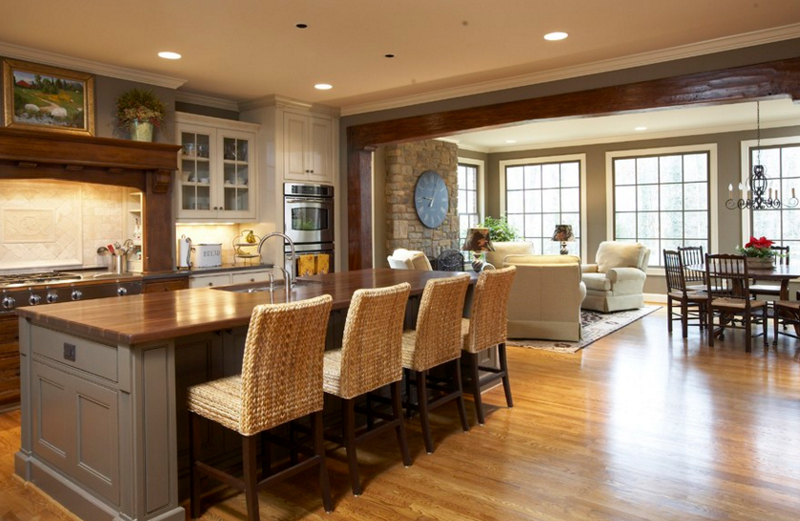 Below is a list of wonderful kitchen spaces with rattan chairs – either for the kitchen island or kitchen bar and even paired with a kitchen-dining room table. 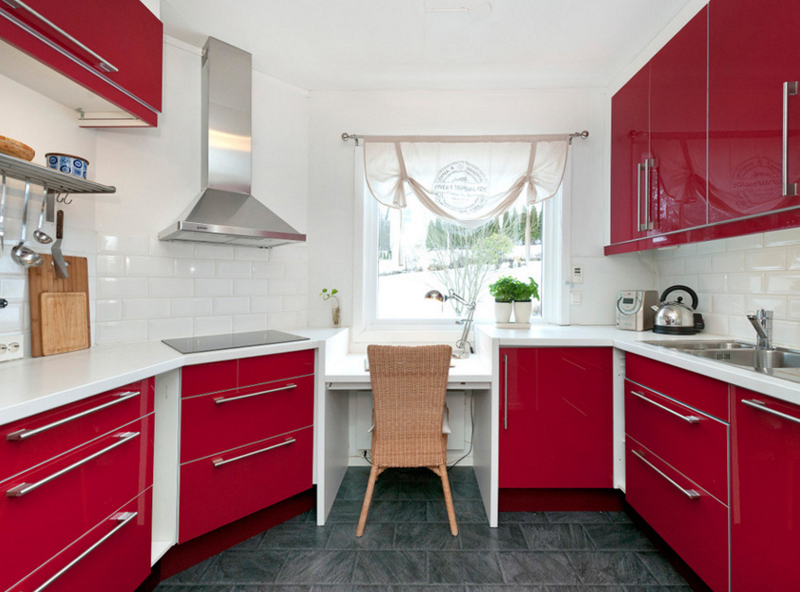 The color of the furniture differs from one another; this is only because home owners or furniture designers use a certain wood color which is chosen depending on the design and motif of the kitchen. Take a look at the list below and tell us what you think about them! This is one gorgeous kitchen space in black and white. When you least expect rattan chairs, you see one! In most contemporary spaces that I see, it’s usually where black and white kitchen and furniture would mean black and white chairs or even metallic ones; but don’t get me wrong guys, the chairs in here are stunning and pretty refreshing! These rattan kitchen stools is ideal for me – because of the fact that it has a back rest but not entirely, so that at some point when you’re sleepy, the short back rest keeps you at your feet. 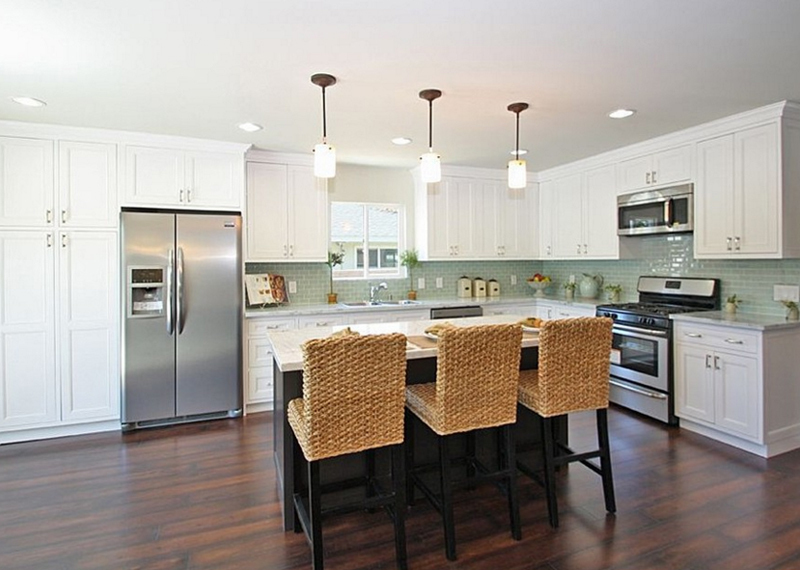 The color of the chairs is nice which complements the kitchen just fine. Now, there is just one chair in here, but I don’t think that it’s a bad idea since this space could easily pass for a home belonging to a single person who does not need the extra chairs. The table and chair combo in her looks like some place the home owner reads or makes her recipes. 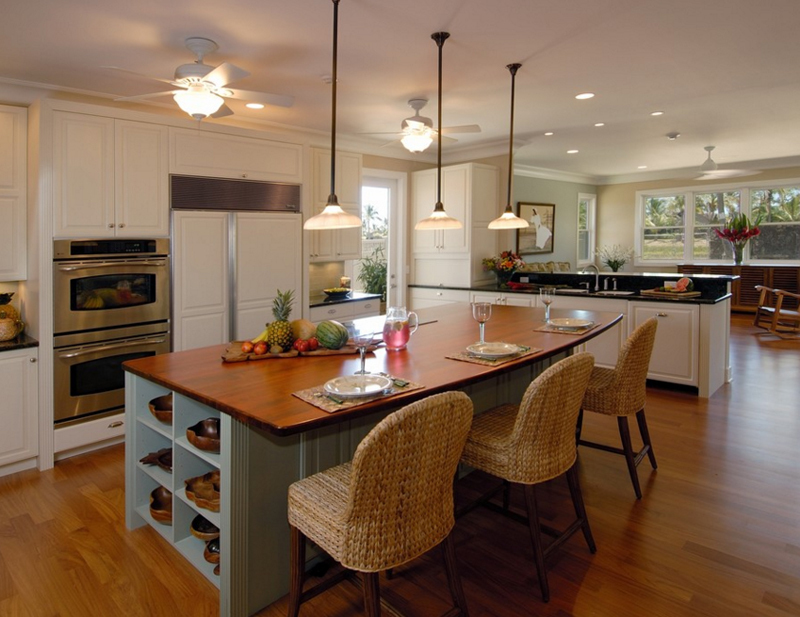 Here’s a nice approach to making the rattan furniture blend with the entire kitchen. 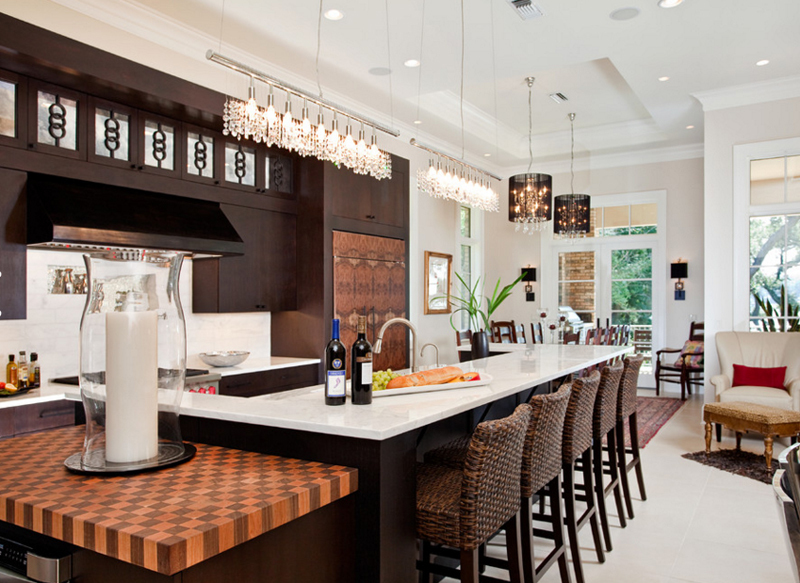 The chairs have black bodies which match the wood work above the range and the added brown cushion and rattan weaving for the back rest is the reason why the chairs actually stand out in this picture – and kitchen as well. 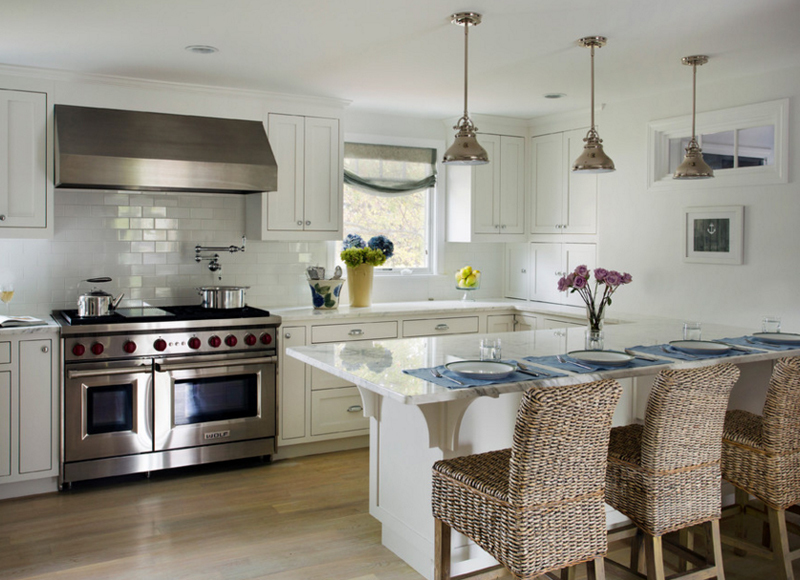 The lighting fixtures in this kitchen sure looks like they’re expensive and hard to maintain – but as we all know, there are things that might be expensive or whatnot, but still worth it; we just have to be careful in choosing and in investing for the future. We don’t need lighting fixtures that needs to be replaces after a few weeks or what. Now the pendant lights in here sure is simple but very pretty. 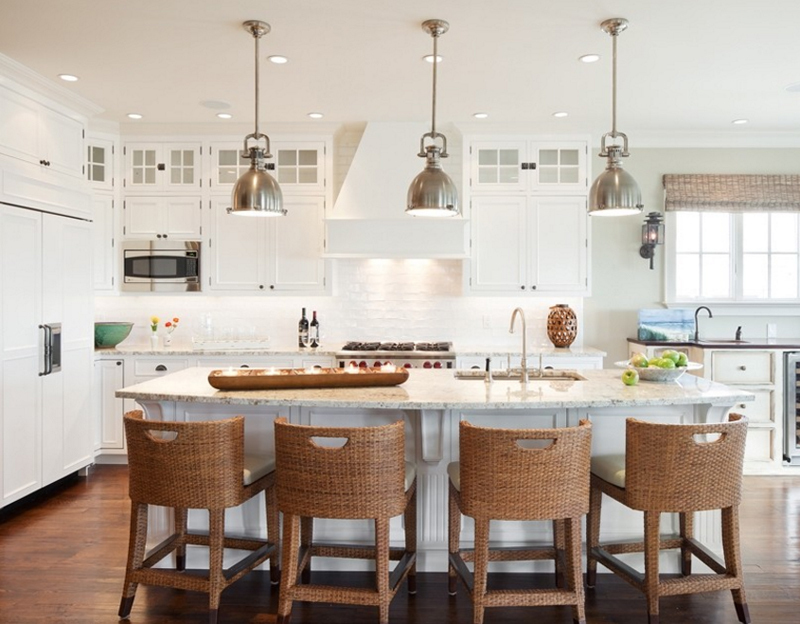 It does not overpower the color or design of the kitchen; for me, looking at this kitchen space, it’s actually the rattan kitchen stools that makes for great accent to this simple kitchen – very subtle but you know it, when you see it. The design of this rattan chair may seem common, but at least, you can actually see and pretty much target if what you want for your home would look stunning as the spaces in this list. 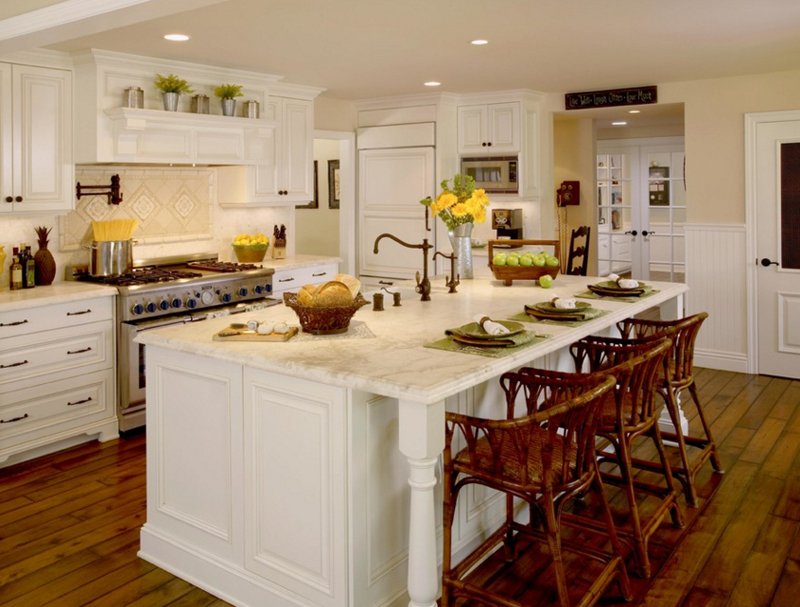 The white or dirty white cabinets and island looks boring unlike the chairs. Feeling like you wanted to add a hint of Asian in your contemporary kitchen? Adding a set of rattan chairs might actually do the trick. All you need to do it make the right choice with the furniture and you’re pretty much good to go. The multiple color of wood in this kitchen is quite confusing – even choosing the color of the rattan chair is slightly off for me. At some point though, I think that it’s the lights that are expected to be the ones to be noticed in this kitchen – it’s vintage and preppy, it’s a choice for this kitchen. 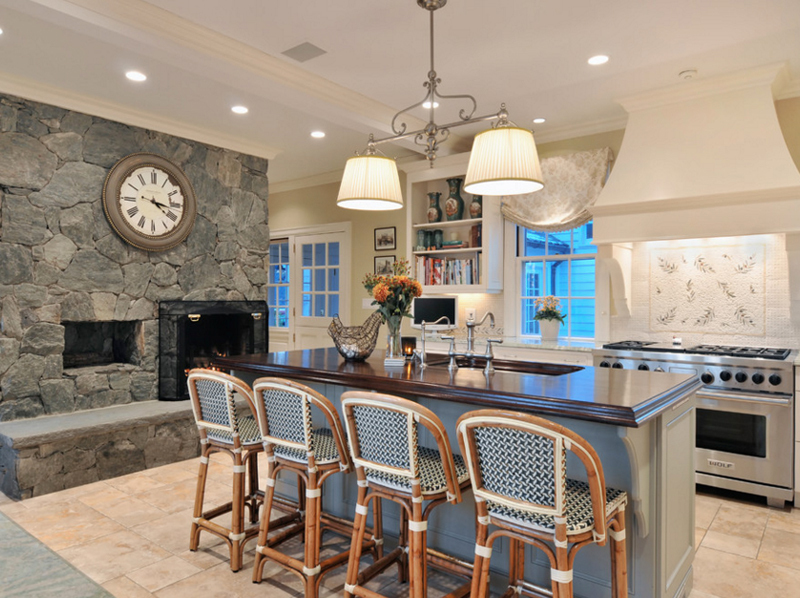 If this kitchen belonged to a family of seven, where are the other four chairs for the kitchen bar? Nah, I’m kidding. Take a look at the details where the rattan ends and the other type of wood begins – the weaving is basically the same, but that particular detail makes it a little special. The color of the rattan chairs I love! 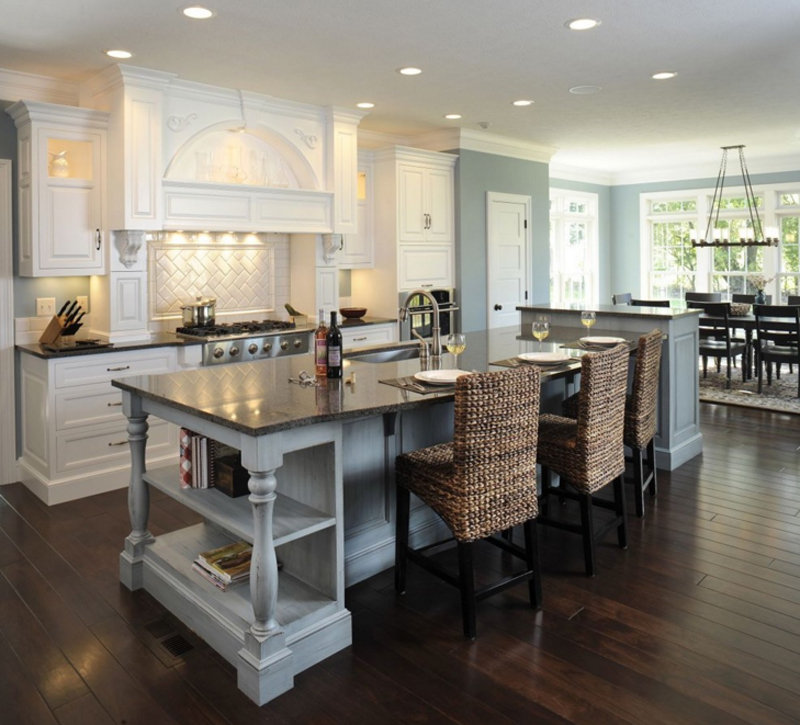 It contrasts with the color of the kitchen counter-island and the flooring too. Notice how much seating is seen this open floor plan – and realize that the name of this photo is actually ‘gathering place.’ I love the concept of this space, almost definitely. 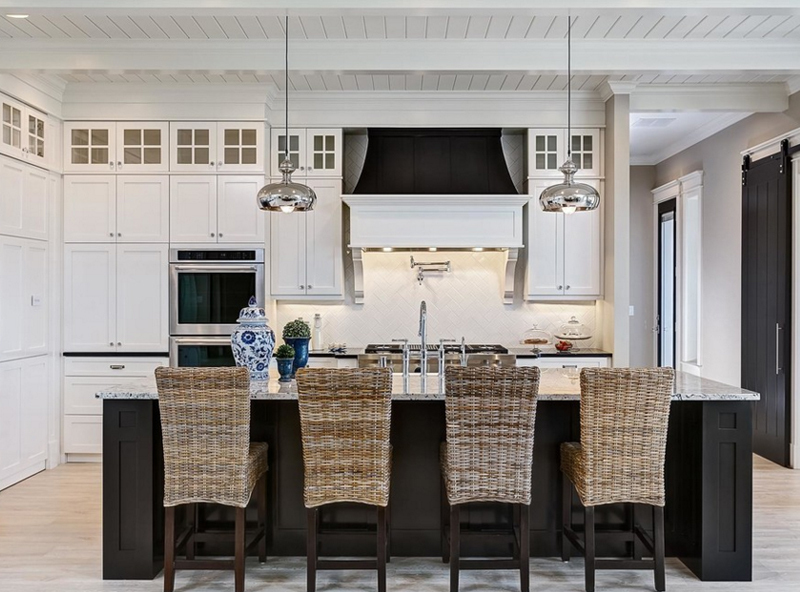 Not all white kitchens are located by the beach or near the beach or what – but sometimes, aside from the name of this photo and the additional rattan chairs by the bar, you can say that this home sure is close to a beach. The contrast of the materials in here makes it eclectic and cool. 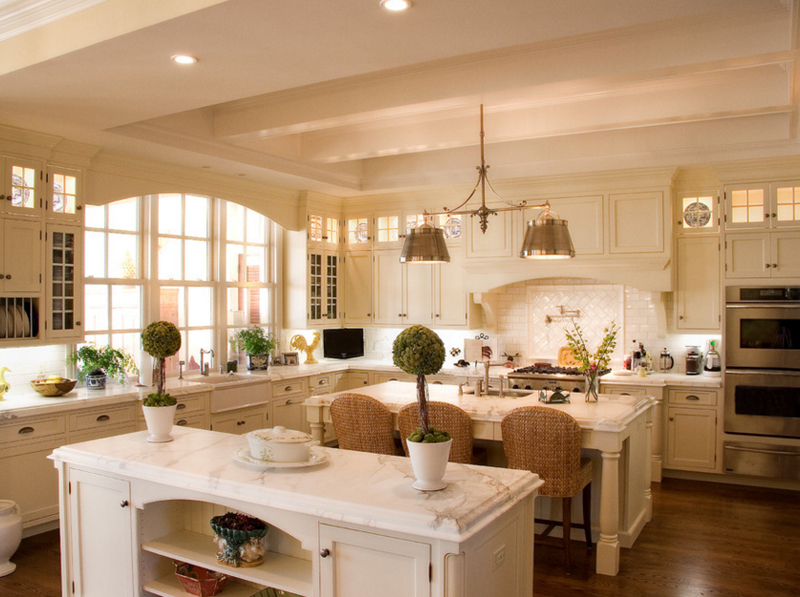 Pretty awesome kitchen, right? Well, I’m sure that even when the kitchen bar is quite far in this picture, you can see that the chairs in there match with the chairs in this dining room set. The colors and weave and probably even the designer or where they got these chairs are the same. It’s nice and makes for cool furniture. Take a look at the way the chairs in here were done – it’s familiar, right? Somehow similar to this Asian kitchen that we have featured in here or maybe we have seen in the internet. The design and material of the chairs contrasts with the other things in here – but it sure works just fine. I love the large clock and the rooster table decoration in here too. The shape of the back rests of these chairs sure looks different from the contemporary ones we commonly see – even on this list actually; but isn’t it what makes it more fascinating and interesting? 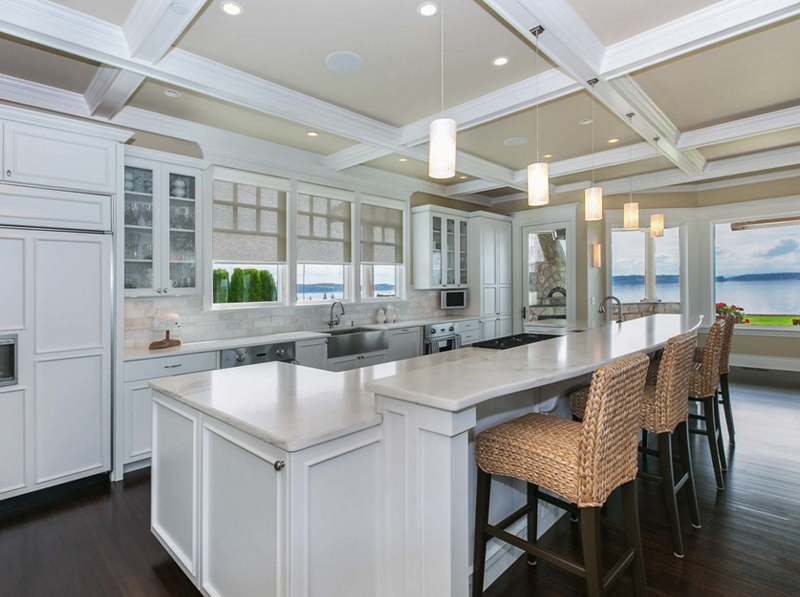 The color of the body of the kitchen bar even seems cooler than the ceiling fan in here. I love how this space can seem so random all at the same time. The high chairs in here looks really neat, nice and cute. It match well with the cute kitchen counter/bar. The fact that this kitchen has an easy access to a balcony with a nice view is a plus point for this home. 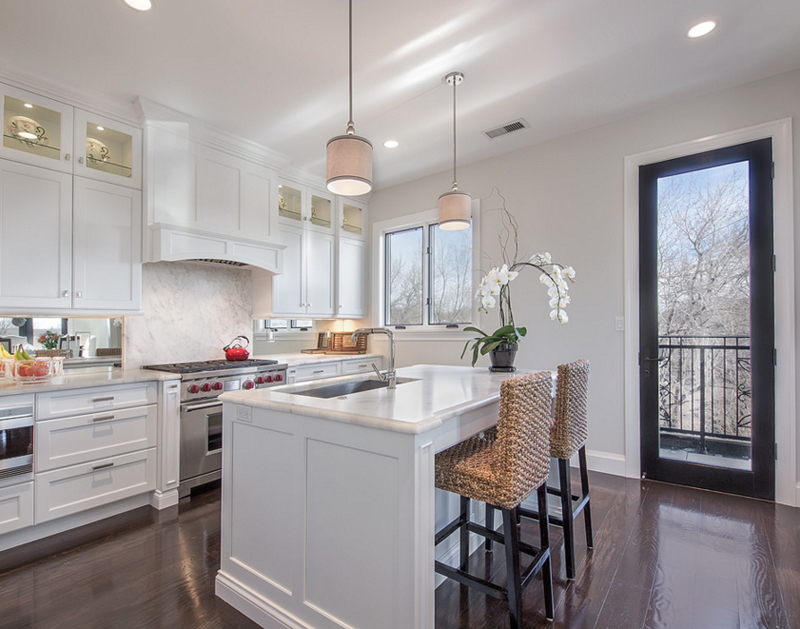 This kitchen sure is sophisticated in white! Here are similar rattan chairs from something on this list – only a bit darker in shade. 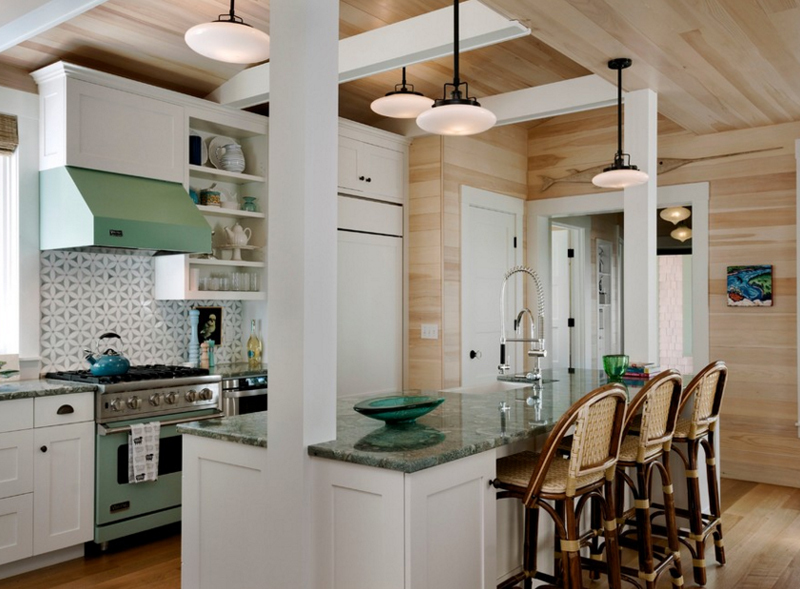 It makes a lot of difference in this kitchen because of the color combination seen in here; the light-colored walls, the white kitchen cabinets and bar and a green granite counter – and notice the green range and hood too! Looks like my younger sister would love this kitchen because of the greens! 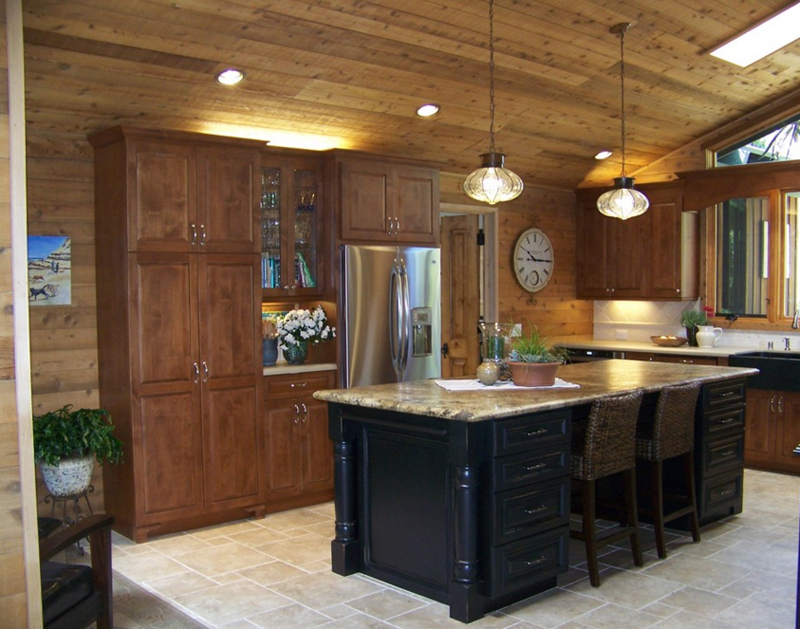 This is one expensive kitchen – from the feel of it to the obvious stuff you see in here. If you’re actually a fan of building materials and whatnot, at one glance, you can see when something is expensive or not; notice the large pendant light in here and tell me what you think. 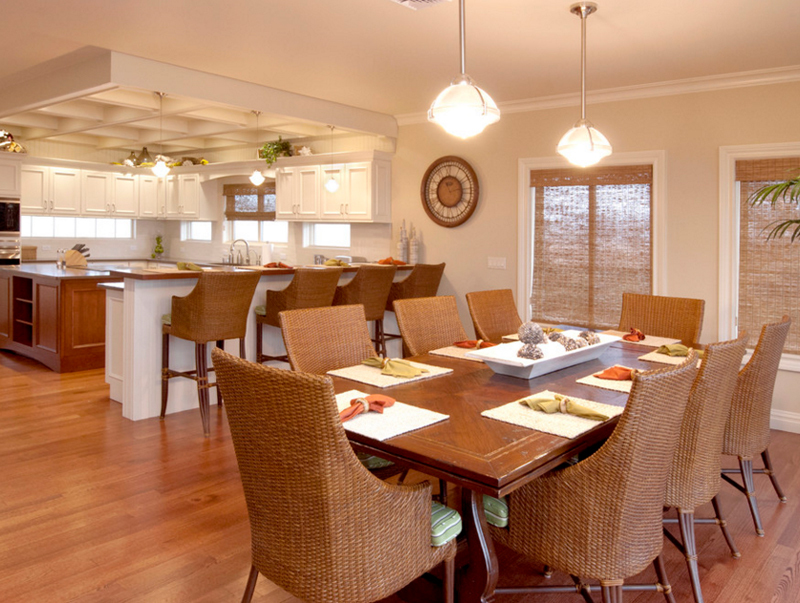 Now, for the finale, this kitchen does not have a bar or a high counter, but you can definitely see that they added an entire dining room set in here to showcase the beautiful table and the lovely rattan chairs. As I was saying above, once you search rattan in the internet, you will also know that rattan is one of the best furniture material that is easy to harvest, transport and even grow! If you know rattan and actually like it, you’ll know that aside from furniture, rattan is also popular for weaved baskets. Like some of the chairs above, I’m pretty sure that you noticed the woven portions of the chairs in this list too, right? Moreover, you can also check the list about the 20 Fascinating Rattan Chairs in the Dining Room and check out for yourself. Don’t forget to share guys! More to come in Home Design Lover!